This is the 29th year Room Dances Festival has been held in Jerusalem and in Tel Aviv. The festival wishes to create an intimate experience of movement, centering on solo dancers or small ensembles performing in venues where no partition exists between stage and viewer. The dances all aim to give precedence to the dancer-creator, while examining new forms of creation and dance-language which emphasizes the intimacy between dancers and viewers. Throughout the years, the festival promoted different independent manifestations of chamber dance, wishing to position itself within the context of current developments in dance. A special emphasis has been given to artists who wish to understand and define their tools and methods, and on collaborative works by multiple artists, believing in the importance of collaboration as a means to expand the language of dance, and in its contribution to bringing the audience closer. Each year, the festival presents premieres by local choreographs, in addition to hosting artists from abroad. Some of the festival’s notable guests in the past were Simone Forti, Lisa Nelson, Mary Fulkerson, Julian Hamilton, Susan Rethorst, Benoît Lachambre, Bruno Stefanoni, Pauline de Groot, Benno Voorham, Claudia Jeschke, Elizabeth Fisher, Riki von Falken, James Saunders and musician Malcolm Goldstein, among others. A different theme defines and illuminates the festival each year: and serves as background or a lens through which the works are created, wishing to offer the artists and the spectators an additional perspective for examination. Our belief in the necessity of discussing the relationship between movement, theory, thought and the senses, led us to create an annual conference, which takes place alongside the performances. In the conferences dancers can express their thoughts about their work, and experts from various fields offer additional angles to further expand the discussion. In 2012, after leading the festival for 23 years, Amos Hetz was joined by Lior Avizoor as co- artistic director. Their partnership further enriched the festival's curation, also giving each of them an opportunity to reexamine various themes in their work. This dialogue added new artists and new approaches to the festival’s infrastructure, and it keeps growing in participants and audience. With a stronger emphasis on the intergenerational relationship, one can find a wide age range among performers and viewers alike. The first festival, produced by Diana Shoef, was held in Bograshov Gallery in Tel Aviv and in a gymnastic hall at a school on Narkis street in Jerusalem. It was founded with the help and support of the Jerusalem Foundation, and is supported throughout the years by the Ministry of Culture and Sport – Culture Authority, the Municipality of Tel Aviv, the Municipality of Jerusalem and The Hapais Council for Culture and Art. 41 years ago, Amos Hetz founded Tnu’ot Dance Ensemble, and ever since he has been working to promote chamber dance, a dance form in which movement alone, unaided by any stagecraft, is able to provide an autonomous experience. The ensemble’s work was founded on EWMN (Eshkol-Wachman Movement Notation), and it is still the tool Amos uses to create his dances. 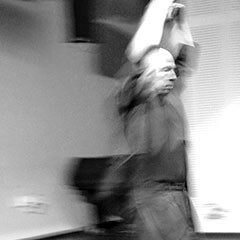 During the 80's Amos formed the Department of Movement and Movement Notation at the Jerusalem Academy of Music and Dance, which he headed until retiring in 2002, and In 1989, he founded the Room Dances Festival. Amos teaches and lectures on movement and EWMN, and has performed in various festivals in Israel and abroad. In 1999 he received the Jerusalem Prize in dance, and in 2013 he was awarded the Mifal Hapais 'Michael Landau Prize' for the Performing Arts. Talia De Vries graduated from the Research Studios pilot#2 program in P.A.R .T.S in 2016, and holds a B.A in Performing Arts from the University of Paris 8, which she obtained during her studies in CNDC of Angers, France in 2009/2011. Since 2011, she has been developing her own artistic work and been working with artists such as Emmanuelle Huynh, Arkadi Zaides, Myriam Van Imschoot. Since 2016, she has been working closely with the artists Susanna Hood (CA) and Vicente Colomar (SP). Alongside her artistic work, Talia is also the co-artistic director of the ‘RoomDances’ Festival in Israel, directed by the artist Amos Hetz. And is working in the Israeli National Digital Collection project of the establishment of a digital archive for Israeli dance.